The topic of the reconstruction of the Gaza Strip and the recent Cairo donor conference has been the focus of several items of BBC content over the last couple of weeks on a variety of platforms including the BBC News website (see here and here) and BBC World Service radio’s ‘Newshour‘. In addition to the above, audiences could also read a report by Kevin Connolly published on October 16th under the title “Gaza reconstruction facing obstacles despite aid” which remained on the website’s Middle East page for five consecutive days. BBC Radio 4’s ‘The World Tonight’ also promoted the same topic by means of an audio report by Kevin Connolly and saw fit to advertise the item separately on Twitter on October 23rd. Connolly’s written report uses the same kind of context-free descriptions of damage seen in so many other BBC reports, with no effort made to inform audiences that the reason districts such as Shuja’iya were the focus of Israeli activity is that Hamas established infrastructure and placed military assets in such residential neighbourhoods. “The level of damage in parts of Gaza is extraordinary – the UN Secretary General, Ban Ki-moon, called it “destruction beyond description”. No-one who has seen at first hand the power of modern missiles and artillery shells could fail to be awed by the destructive forces they unleash. Huge buildings fashioned from thousands of tonnes of concrete have been reduced to dense, shallow, uneven mounds of rubble, as though they had been sucked in on themselves. No less lacking in context – or less predictable – is Connolly’s description of the effects of the border restrictions imposed by Israel and Egypt, with no effort made to inform audiences that those restrictions exist because Hamas elected to pursue a policy of terrorism. Once again we see BBC portrayal of Palestinians as having no agency and no responsibility for their decisions. As equally unsurprising is Connolly’s promotion of another frequent, yet erroneous, BBC theme: the notion that the solution to the conflict between Israel and Hamas is resolvable via negotiations. Notably, Connolly deviates from the BBC’s previous promotions (see for example here and here) of a UN administered ‘mechanism’ to prevent construction materials being misappropriated by Hamas for the purposes of terror but fails to adequately clarify to readers that Israeli “security concerns” are based on past experience which shows that materials which were imported into the Gaza Strip under international supervision were indeed diverted to the building of terrorist infrastructure, including the 32 cross-border tunnels decommissioned during Operation Protective Edge. Israel has two security concerns. The first is simple enough. Every bag of concrete will have to be searched to make sure it does not have guns, ammunition or rocket parts hidden somewhere inside. The second is slightly more subtle and involves what are called “dual-use” materials – in other words anything that could be used to build either houses or rocket silos, such as concrete or steel. 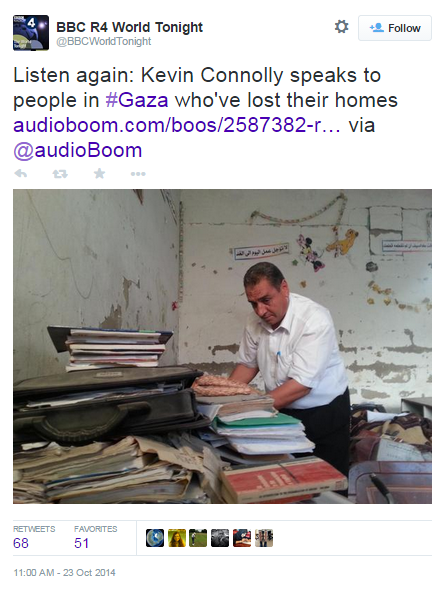 Connolly’s audio report – titled “Rebuilding Gaza” – for Radio 4 promotes many of the same context-free themes as his written article. Like Yolande Knell before him, Connolly features English teacher Abdul Kareem al Ejlah from Shuja’iya, but fails to inform listeners that the vicinity of the teacher’s house was used to launch missiles or that entrances to cross-border tunnels were located nearby, instead opting for the following emotive description. Connolly goes on to promote a project situated on “farmland near Gaza’s border with Israel”. Connolly is obviously less interested in adhering to BBC editorial guidelines on impartiality by informing BBC audiences of the fact that Human Appeal International is one of several British charities which come under the umbrella of the Muslim Brotherhood’s fund-raising network for Hamas – the ‘Union of Good’ – chaired by Qatar-based Yusuf Qaradawi. As such, HAI is banned by Israel, has appeared on the US State Department’s list of charities linked to terrorism since 1996 and was cited by the FBI as a recipient of funds from the convicted Special Designated Terrorist Entity the Holy Land Foundation. In 2005 Human Appeal International was one of two charities named on the charge sheet against Ahmad Salatna – a Hamas activist from Jenin who headed the Jenin Zakat Society and was convicted of providing some £6.2 million of funds originating in Europe to Hamas cells, suicide bombers and their families. Of course the “more permanent” miseries of Palestinian refugees are the direct result of the intentional policies of Arab countries which have been using them as a political card for decades. Like those people, the currently homeless people in Gaza could also have their miseries relieved much more easily were Hamas to change its policies and abandon the terrorism which makes control of building materials into the Gaza Strip necessary. Connolly, of course, exonerates Hamas from any responsibility for bringing about the conflict which caused thousands of people in the Gaza Strip to become homeless as well as for its role in delaying reconstruction. He fails to inform listeners that even before his report was broadcast Hamas was already boasting of renewed construction of cross-border tunnels or that – as documented by the NYT correspondent in Gaza – there appear to be building materials available for Hamas’ own projects such as its Al Aqsa TV building and its Interior Ministry building. 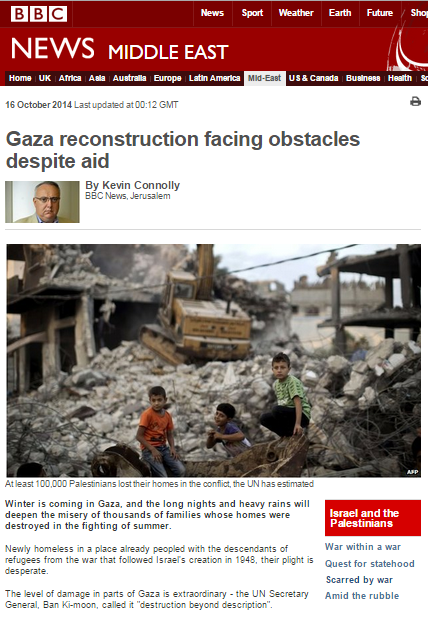 Notably too, despite its obviously extensive interest in the topic of reconstruction, the BBC has so far refrained from informing audiences that the mechanism of monitoring the entry of construction materials (made necessary by Hamas’ adherence to terror) so urgently needed by ordinary residents of the Gaza Strip hoping to repair their houses before the winter was one of the topics set to be discussed at talks in Cairo this week. Those talks were cancelled by Egypt after the terror attacks in northern Sinai and Egypt’s subsequent closure of its border with the Gaza Strip and claims of Palestinian involvement in the attacks.